I’ve written some about productivity as an entrepreneur on this blog before, but in recent months as my schedule has become busier I’ve had to become quite good at managing not only my time but also my energy. 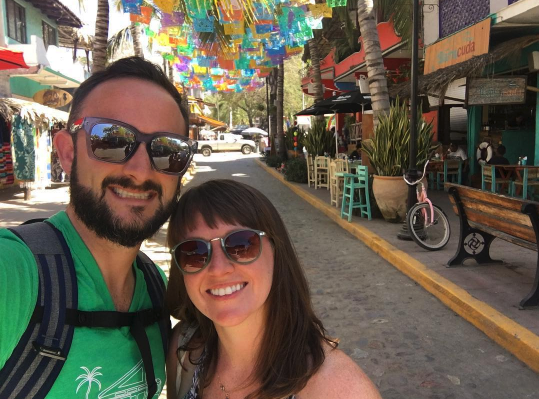 I run two companies actively and try to have a life outside of work, as I have a wife and dog who love spending time with me and going on adventures. And let’s be honest – I love going on adventures too. 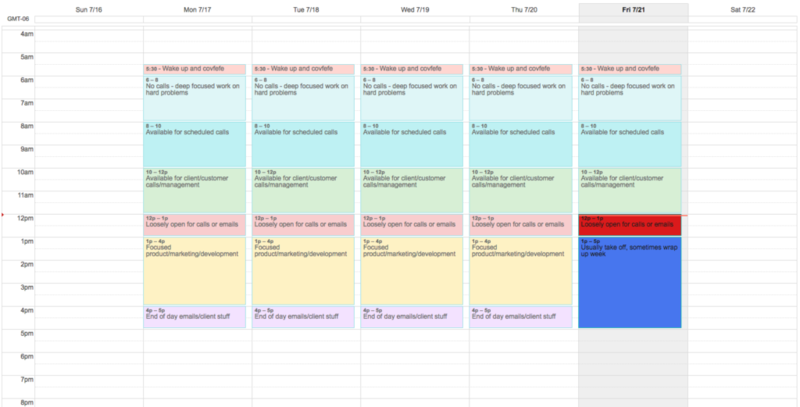 My thinking about schedules has been greatly shaped by Paul Graham’s Maker’s Schedule, Manager’s Schedule, which does a great job of explaining why different people work in different ways depending on their job. Managers operate on a hour-by-hour basis. They’re switching tasks every hour or so, though can definitely block of chunks of time to do other work. Makers operate on a half-day or full-day basis. When you have a problem to work through in code or elsewhere, you need hours blocked off where you are disturbed by exactly no one and nothing. This makes sense, though is a bit simplistic for me. It’s simplistic because I am an entrepreneur and the founder of companies and thus I have a million different “jobs” – sales, product, marketing, biz ops, code, etc. I even have two part time people doing some tasks for me, so I was even busier before than I am now! But my schedule just isn’t as simple as maker/manager. I am both. 30 minutes to wake up/drink coffee/get into the day without checking email. Maker time – Time for myself from 6-8a to focus on high-energy tasks when I have not had my energy depleted by the rest of the day. Still no email. Manager time – Check email around 8am, answer the most necessary, then have calls and such as needed until 10. Manager time – Client calls and management happens mostly from 10a-12p, though this can bleed to 1pm if necessary. Maker time – I make things from 1-4 each day, hyperfocused on tasks that I know need to be done. I try to wrap up my day by 5pm, though obviously some days it is longer and some days I work in the evening such as with software releases. What this effectively allows me to do is be both a maker and a manager. I’ve learned when my patience is highest and thus I should do phone calls, and when it is lowest in the afternoon (often after the post-lunch slump or when it’s super hot in Denver in the afternoon in the summer) I can retreat to a coffee shop or similar to get real focused work done. This schedule works well for me.